Following up on the success of their first anthology of aphorisms, Short Flights (Schaffner Press, 2015), authors and educators James Lough and Alex Stein have returned with a new volume that expands on the theme of aphorisms to include other short form writing and concrete poetry and prose from several of the world's leading, award-winning, and bestsellling writers in the genre, including Charles Simic, Lydia Davis, Sarah Manguso, Jane Hirschfield, Joy Harjo, Yahia Labadidi, Claudia Rankine, and Stephen Dobyns. "This book, a compilation of what feel like urgent text messages from some of the 21st century's best writers, operates as an early warning system to the future of literary art. Crucial." 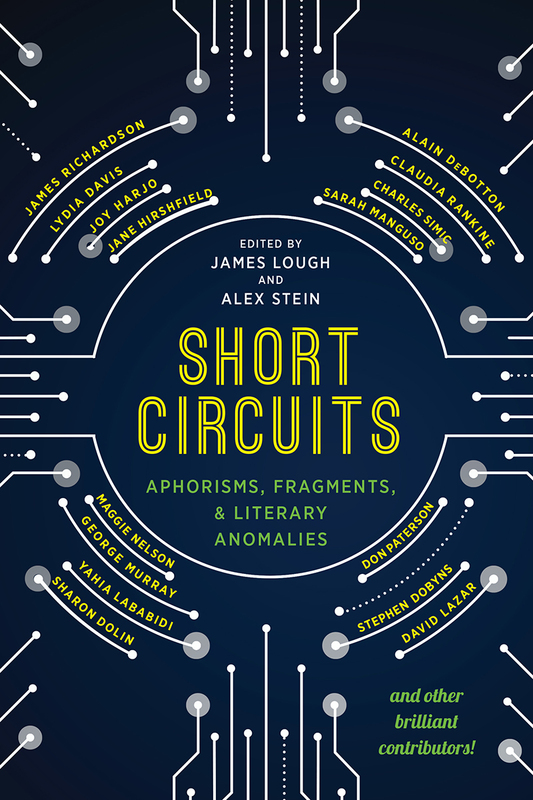 "Short Circuits is a knockout beautiful book full of wonderful stuff that makes you laugh, smile, shake your head, admire writers, feel touched, honored, charmed, surprised, a little threatened, a lot thrilled. Lough & Company have done a brillian"